The Guardian News Joseph Votel U.S. Pakistan relations Is CENTCOM Commander General Votel Undermining President Trump's Pakistan Policy? Is CENTCOM Commander General Votel Undermining President Trump's Pakistan Policy? Pakistan’s Chief of Army Staff (COAS) General Qamar Javed Bajwa in a meeting with U.S. Commander General Joseph L Votel has reiterated support to an Afghan-led peace process and reconciliation process but insisted that the blame game should be ended. 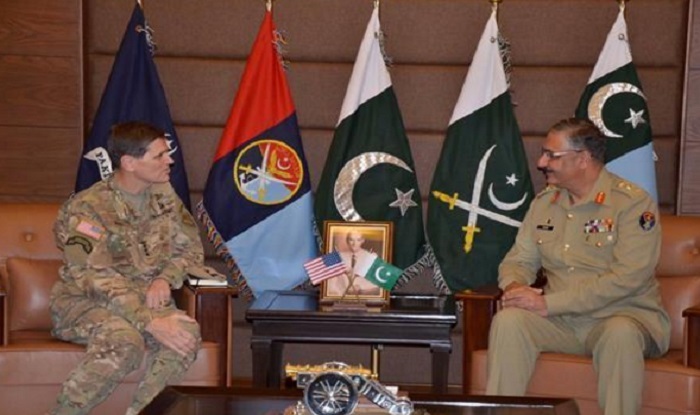 In a meeting with Commander United States Central Command (US CENTCOM), General Joseph L Votel, at the General Headquarters on Monday, the COAS said that Islamabad has played a vital role for peace in region, reports the Daily Times. WNU Editor: If what the Pakistanis are saying is true, CENTCOM Commander General Votel has a lot of explaining to do when he gets back to the U.S..